Is it not time that all of who live in the rural backwoods, and whose convenience, if not livelihood, is under threat from Mr J Ps transport proposals, began to plan how to survive their implementation in about three years time? Here are a few suggestions. There are still a few of us around who are familiar with grandfathers methods, and most of these may still be seen at work in Countries such as India, and are annually displayed by the nostalgically minded at our agricultural shows. I refer of course to our four legged assistants, the horse, donkey and mule. Whether there is VAT on the purchase of these creatures I do not know, but there is certainly no licence required, nor driving test before harnessing them; and a search of our barns and sheds would unearth many vehicles that could soon be made roadworthy. Neither is the humble goat to be despised as a provider of power for the junior members of the family. Since many of these creatures could be grazed on what used to be known as the Long Acre, a reduction in the community charge might be anticipated, since there would be less need for mowing road verges. And set-aside land would be brought back into use to grow the oats, beans, hay and other foodstuffs required, with an immense saving in imported oil and subsidies. For the technically minded there remains steam, not the 10 tons of the familiar agricultural engine, but the steam car fired by coke, and employing an adapted automobile engine. These have several advantages. First, and perhaps foremost, their extensive use would be the salvation of the threatened coal industry, and motor manufacturers would still be needed. Finally there is dog power. I myself have recently become aware of the tractive energy of just one 18 month old modest sized pup, attached via its lead to Batty Ferrari: behind a team of eight or ten, harnessed to a professionally designed Rig, it would be Ipswich or Colchester stations in 50 minutes. And what could be better for the school run? No child would want to skive off when offered such an opportunity. The nucleus for a local taxi service is ready to hand in the kennels of the Essex & Suffolk Hunt at Layham. Both dogs and their handlers are threatened with redundancy, and should commence retraining immediately. Compare the prices of a range of goods, taking into account the real costs of travel and time. Societies have something distinctive to contribute to local partnerships and should welcome the chance to make common cause with local traders. English Heritage is encouraging local authorities to make frequent and earlier use of their statutory powers to serve Urgent Works and Repairs Notices by establishing grant schemes and producing detailed technical guides to their use. In its newly launched Buildings at Risk Strategy, accompanied by the first ever countrywide Register of Buildings at Risk, it also examines the all-important issue of the end use of buildings once rescued. The average life span of an urban tree is 32 years, having to cope with an array of hostile conditions such as poor soil, air pollution, wind exposure, de-icing salts and trenching for cables. From a Civic Trust survey of Societies' activities around the UK comes a list of suggestions for joint ventures in the community. A government research report said large out-of-town supermarkets were taking up to half the market in small towns and district centres and forcing many food shops to close, with devastating effects on small market towns. The net result was a general decline in the quality of the environment of the centre. Richard Caborn, minister for the regions, regeneration and planning, told the Action for Market Towns conference in Shropshire the report firmly establishes that out-of-town superstores can seriously damage the health of small towns and district centres. He urged local planning authorities to get their plans up to date and identify the town centre sites where new shopping development should be encouraged. "Planning has got to change from being reactive and negative to being positive and proactive. The only way to get development where you want it is to plan for it." The third series of BBC2s architecture and history programmes, The House Detectives, is due to go into production this autumn. They are currently compiling a list of possible buildings to investigate and would welcome suggestions from individuals and Civic groups. Each half hour programme will seek to uncover the story of one house - from the moment it first appeared to the present day. The programmes need to cover social as well as architectural history so houses that might reveal a good story and interesting previous occupants are particularly welcome. Especially of interest are houses that could possibly have been shops, hospitals, pubs, centres of trade or manufacture or which could have a connection with interesting historical events in the locality. The Ipswich Society is involved in a Heritage Lottery Fund application to build a Visitor's Centre on the Anglo-Saxon waterfront of St Peter's Quay, near Stoke Bridge. It is to be a museum, educational resource and tourist attraction, telling the story of the beginnings of the English and their language with the aid of the latest electronic display techniques. That by the beginning of the next century Ipswich may have achieved city status must surely be welcomed, but tempered by reservations. Official reaction seems to be based upon euphoria rather than reality. If indeed Ipswich is the entertainment centre of the region, a proliferation of pubs, night clubs and pop concerts hardly improves our image or constitutes any claim for becoming a city - quite the reverse. The claim that Ipswich is the regions major shopping centre is a complete misrepresentation of facts. Until the 1960s there were still a number of prestigious stores - Gardiners, Masons and Corders for the ladies, Ridleys, Grimwades and, for a time, Austin Reeds for the gentlemen. All these have now gone and not been replaced. Although Ipswich now has five department stores, none are of the status of a Rackham's or Harvey Nichols. Most of the remaining shops in the town centre now cater solely for proletarian tastes, proclaimed by loud piped pop "music". The "dumbing down" of the town centre is completed by the ever-increasing number of hamburger eating-places and take-aways which encourage customers to munch their meals in the street, scattering litter as they go. PS No apologies for �litism: just what is needed these days lots of it. Trinity House set up a depot in I Harwich in 1812, and it is now operational headquarters for England and Wales and a major employer in the town. Trinity vessels have been seen in Harwich Harbour for over 150 years. They fell into two classes: the smaller pilot cutters (mostly identified by numbers) and the larger tender ships (identified by names) which service the buoys and lightships. The two classes were operated by two distinctly separate departments within Trinity House, and neither the ships or their crews were interchangeable between the two departments. The pilot cutters disappeared from Harwich Harbour when the local pilotage service was transferred from Trinity House to Harwich Haven Authority in 1988 at Government command. Among the tender ships seen in Harwich Harbour were Alert, Siren, Triton, Mermaid, Vestal, Ready, and of course Patricia, flagship of the fleet, and the only vessel allowed to precede the Royal Yacht (when we have one) in home waters. In the immediate post-war years there were four tender ships based at Harwich, but since 1973 different systems of manning and improved technology with buoys have led to the number of Harwich tenders being progressively reduced from four to three, to two, and now to one, the Patricia, built in 1982. The Mermaid, built in 1988, sometimes seen in Harwich, is technically based at Swansea. The much-loved earlier Patricia (1938-82) is now a floating restaurant in Stockholm Harbour. COSFORD HUNDRED SAVING'S BANK is at Hadleigh. It was founded in 1818, and is open every Saturday, from 10 till 2 o'clock, at Messrs. Mills and Co's bank, in Queen Street. Mr. Grimwade is the actuary. On November 20th 1853, its deposits amounted to �21,420, belonging to 659 depositors, 28 Charitable Societies, and 11 Friendly Societies. There are in the town two Friendly Societies, a Lodge of Freemasons, and another of Odd Fellows. The Charities of Hadleigh produce a yearly income of about �900, and comprise Almshouses for 36 poor people, and a Free School, now amalgamated with the National Schools, which are attended by about 120 boys and 200 girls and infants. Here is also a large British School, built in 1841, by J. Ansell, Esq., and divided into three apartments, for boys, girls, and infants, of whom about 160 are generally in attendance, but the rooms will accommodate 300. Here is a LITERARY INSTITUTION, with a good library and reading room. If you'd like to see more of that issue and have access to the Internet you can find it in the collection on our Web site. The address is in the 'contacts' at the end of this newsletter. On Tuesday 24th November at 8pm in the Old Town Hall our History Group will be presenting the story of Hadleigh's Charities, from 1400 through to 1900. On what must have been the hottest night of the year Sue Andrews showed us what John Constable missed by not travelling a bit further up the Stour to, arguably, the even more beautiful territory of the Brett valley. From three headstreams within the undulating fields of central Suffolk to its confluence with the River Stour at Higham, the Brett complements and enhances the unspoilt settlements along its banks. Life begins for the Brett as a tiny trickle in a field drainage ditch but centuries of argument have not settled the controversy as to which headstream actually gives birth to the river. Ordnance Survey maps indicate the stream from Brettenham as being the Brett but where these waters form the boundary between Monks Eleigh and Chelsworth they are also known as the Marlele or the Wagger. The most westerly branch appears to be the main flow of water, rising as it does in Cockfield near the Hundred Stone Pond, but as it passes Lavenham the local name of Brad is applied, while the third, easterly headstream surfaces at Hitcham and is known as Bildeston Brook. Whatever the name, the course of the river was followed, with slides and stories. The imposition of taxation in 1524 with a subsequent revolt of cloth workers was the tale told of Lavenham. At Brent Eleigh the now vanished parochial library was featured; a Monks Eleigh charity to support the church clock and the granting of Chelsworth as an estate to an Anglo-Saxon queen were accompanied by local views; while Bildeston was visited the day in 1975 when the church tower collapsed. The place names of Semer, Kersey and Cosford all make indirect reference to the river and the history of its two important bridging points in Hadleigh were discussed, together with the 1799 plans for canalising the Brett. A stroll along Hadleigh High Street featured scenes from different periods in the twentieth century. Finally the confluence site at Higham was shown, where the waters of the Brett join those of the Stour, eventually to flow out to the sea. Our thanks to Sue for a fascinating talk that certainly made us forget how oppressively hot the evening was. Although there are records of firefighting by the Bury St Edmunds monks in the 11th century it was not until the 17th century that we regained the standards previously established by the Romans. Although London had the best known disaster of that period there were several examples of Suffolk towns and villages losing half their properties. 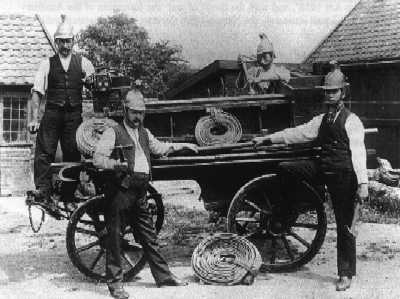 Insurance companies took control of the business at the start of the 19th century, with two companies competing in Suffolk. In a talk illustrated with photographs from his book, Graham Saward took us through the centuries, finishing at 1948 when the county-based services took over from the wartime-nationalised service. Amongst the many fire teams proudly posing was the Hadleigh crew, pictured outside the Town Hall at the time of the Jubilee, although we don't know of which monarch. To mark the 50th anniversary of the modern service this November Mr Saward is publishing the next volume to bring the story up to date. Included will be one of the worst fires of Hadleigh's recent memory, of Budd's shop in the High Street. Last year the Society was asked to host a Suffolk Local History Council Study day. The Society accepted the invitation and the History Group offered to organise the day, which finally came about on Saturday, September 19th. Joe Byrne organised and chaired the day. Sue Andrews started the morning with a brief history of Hadleigh. John Bloomfield talked about timber buildings and Roger Kennell created a new band of enthusiasts for bricks. In the afternoon the 60 guests had the choice of walks looking at timber buildings, brickwork, tours of the Guildhall or looking at the Archive computer, and Sue Andrews had set up an exhibition of items from the Archives. The weather was extremely kind to us, the Guildhall and its garden looking their best. The members of the History Group mustered at 9am for a very long day, moved furniture, ensured that the guests were in the right place at the right time, slogged over a hot water boiler and washed up some 280 cups and saucers. The group served coffee and tea on four occasions and the ladies cooked cakes for tea. The audience, who had travelled from all corners of Suffolk, enjoyed their day and people were very complimentary about the speakers and the organisation. Meet us at the Town Council offices if you want to look at the latest planning proposals. We will be there at 12 noon on the first Wednesday of each month. All are at Hadleigh Old Town Hall from 8pm. Free to members, �2 for non-members.